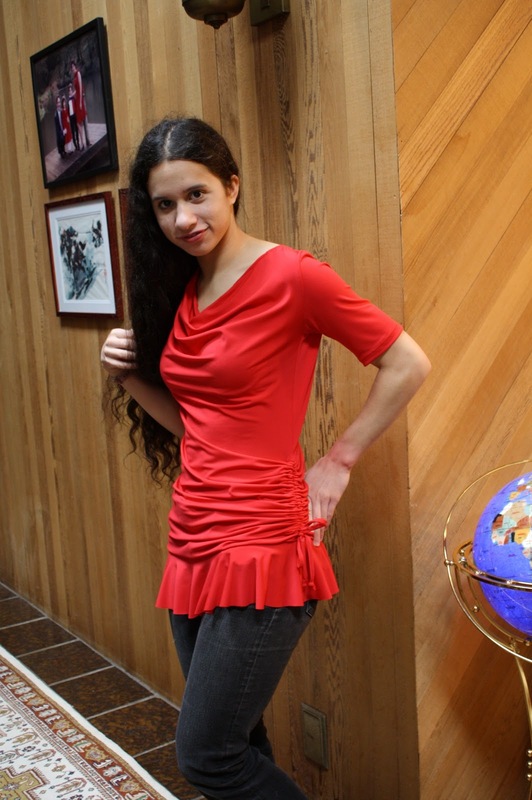 I already had the size 6 cut out, and so to make a version of HotPatterns Mighty Aphrodite top for myself, all I had to do was to taper the waist and hip area to about an 8 while cutting. Oh, yes, and trace out the long sleeve. So this went FAST! Finished in about a day, in between driving kids to activities and cooking meals. While cutting out the pieces, I discovered a great way to get the grainline more accurate. This fabric, a rayon knit, I think, has very wavy selvedge. I think these knits are usually knit in a tube, then the tube is cut open and the edges glued so they don't unravel. So there was no way I could use the selvedge as a grainline reference. Here's what I did, using 3 quilting rulers. 1) Line up a large quilting ruler somewhere off the pattern piece, right along a row of knit stitches. You may have to pick up the fabric and rearrange it so that it is straight. 2) Use one 12" ruler to measure from the large ruler to the grainline marked on the pattern piece. It is much easier to place the piece and the rulers so that the mark is to the nearest inch. That way you won't have to remember fractions of an inch. 1) While reading the instructions more closely this time, I figured out how they wanted me to sew the hem flounce on, though it still leaves out a couple of steps. There is no "slit" needed for the drawcord to pass through because you turn it up at the hem, then open the wide seam allowance out and stitch the channels. The drawcords will come out of the bottom of the channels. The flounce is supposed to be sewn on, tapered to the drawcord area. It just needs a snip to let the seam allowance free from the drawcord channel. So you bypass a triangular piece of the flounce as you sew it on. 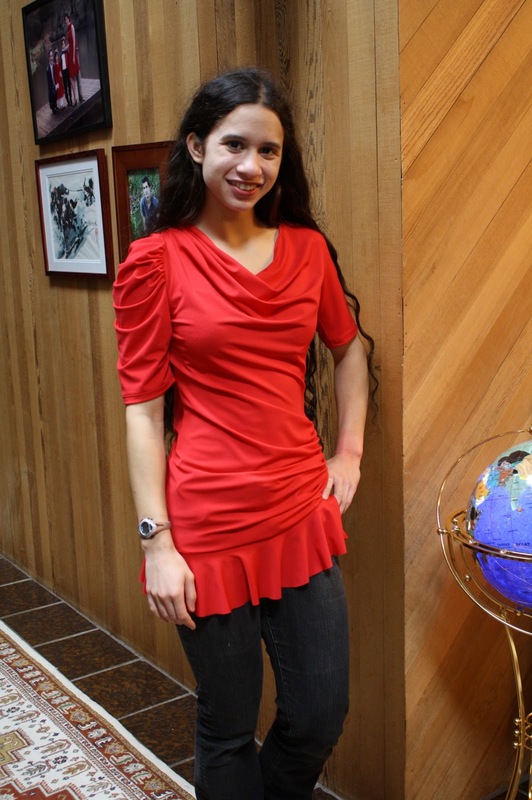 2) In the comments section of my pattern review of this top, Nancy K provided some very helpful info on sewing the shoulder pleat. Yesss! I traced this out and couldn't figure out the pleats either, so I emailed Trudy and got a diagram back. The notches line up as follows: the first notch which is single, lines up with the first of the next two notches. The second one lines up with the first of the next two etc. I refuse to wear T-shirts. They look absolutely terrible on me and worse, make me feel completely dowdy. But souvenir T-shirts are still fun to receive, and they can be great conversation starters for meeting strangers with a shared interest. So this is what I do with T-shirts. I cut them up with no regret! Slash, lop and snip! No more chokey neckline! No more baggy waist! The Jalie pattern I like to use as a template is a tank/camisole top with a marvelously flattering cut which I have used over and over and over again. Unfortunately I do not think Jalie prints the pattern anymore, but it wouldn't be complicated to draft your own. 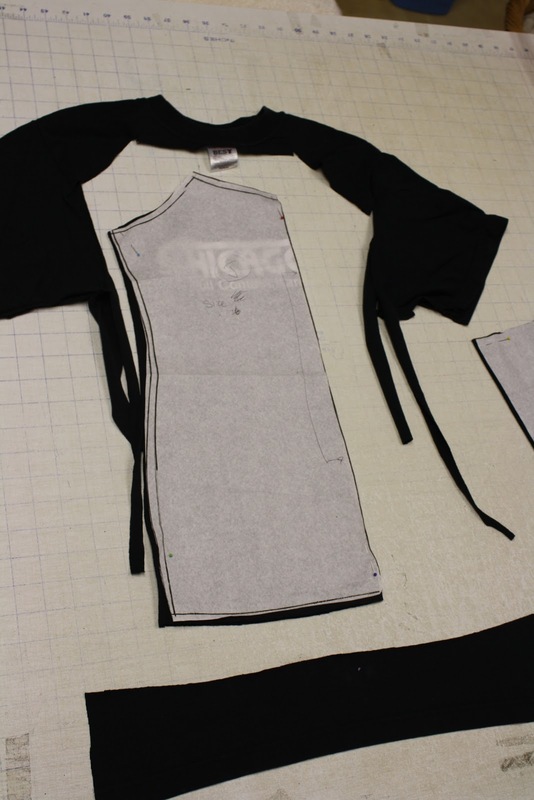 For the Chicagofight top, I used a strip I cut off from the hem to create straps. One side is "hemmed", the other side is a double raw edge. I needed more strips to create the lattice effect, so I cut more strips off the bottom of the T-shirt and "hemmed" them to match the cut off hem. For the Aldo Nadi top I created wide straps/sleevettes by cutting rectangles the length of the measurement over the shoulder from front bodice to upper back, and about 6 inches wide. Then I simply gathered the ends of the straps and sewed them onto the fronts and backs. So don't be afraid, cut into them! Your T-shirts are bound to look better than before! Okay, I've decided to fire this blog up again, after a long absence. I was somewhat annoyed by how long it takes to load photos, but I think it might be better now. I made this dress from Burdastyle magazine pattern 7-2010-117, for my niece, Malia. Available for download at Burdastyle. It looks fine in the photo, but it is about 2 sizes bigger than I would have made for myself. The ITY fabric is really stretchy. This is the second version of the dress I've made. The first was in white, for my daughter, to wear at a wedding. And yes, she looked almost too fabulous. 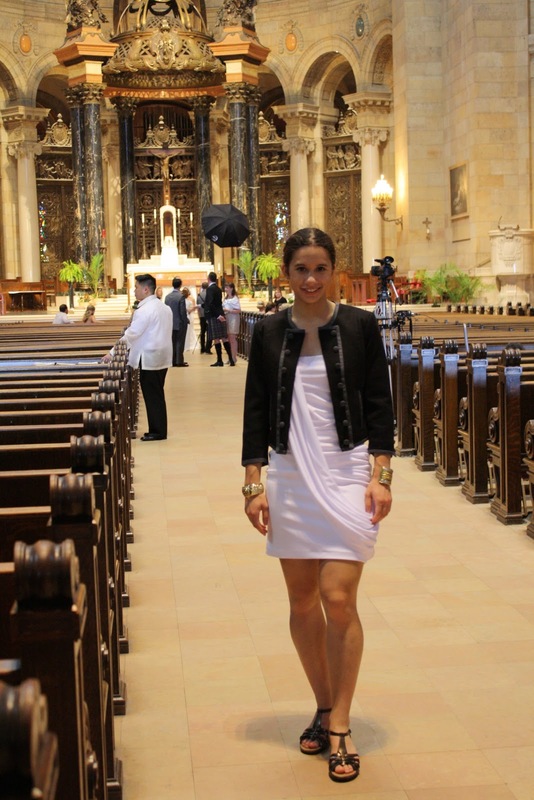 We were concerned about her having exposed shoulders in the church so we added a dark blue military style jacket which I think went perfectly with the dress. She loves contrast, too. But guess what--all the bridesmaids were shamelessly wearing completely strapless dresses! Yes, you knew it! At the reception, my daughter had a little bit of slippage of the upper edge of the bodice while she was dancing, but well, she moves around quite a bit. Malia really liked the dress so I promised her one, which conveniently arrived around her birthday. Some sewing details: On the white version I underlined the whole dress with self-fabric. This was necessary, as it is white. However, this thickened the seams. It was okay, as no one but me would notice this. The directions have you doubling the fabric for the drape but I didn't think this was necessary, so I used a single layer for the navy version. You should experiment with positioning the lower end of the drape before sewing it in, somehow. An afterthought on my part. I think different fabrics definitely drape differently. On the navy version, I twin-needle stitched the hem, but on the white version because of the underline, it would have been too thick, so I used the pseudo blind-stitching feature on my Pfaff.